Will the Midterms Create an Anti-Corruption Mandate? FLORENCE, Mass. (October 17, 2018) – Many David versus Goliath battles are playing out in state ballot measure campaigns across the country this November. The “Badass Grandmas” are in a fight versus Big Oil over an anti-corruption proposal in North Dakota, and there is a grassroots revolt from the people against the politicians over gerrymandering in Michigan, Missouri, Colorado, and Utah. In South Dakota, the people are campaigning for the final say over anti-corruption following the state legislature’s repeal of a similar voter-approved ballot measure last year. As the largest grassroots anti-corruption organization in the country, RepresentUs is seeing these measures unite people across the political spectrum in an era of hyper-partisanship, special interests, and Big Money. With two dozen measures up for vote in cities and states on Nov. 6, reformers are also looking to this midterm cycle as the tipping point for a strategy that sidesteps an inefficient Congress and works to break the tie with Big Money at the community level. Reformers hope a string of state political reform wins will provide a Midterms mandate for congressional action. Conservative U.S. Sen. Ben Sasse has already filed several bills to ‘Drain the Swamp’ and liberal U.S. Sen. Elizabeth Warren has filed an anti-corruption bill. Democrats in the U.S. House, if they win back the chamber, plan to advance U.S. Rep. John Sarbanes’ campaign finance reform proposal as their first bill of the next Congress. As President Trump readies for reelection in 2020 with “Promises Made. Promises Kept.” banners at his rallies along with “Drain the Swamp” signs, he may want to demonstrate a policy victory on the issue. The strategy of winning state laws to build towards federal reform is one that has worked in the past. Twenty-seven states passed laws giving women the right to vote before it passed federally. Thirty-four states legalized interracial marriage before it became federal law. The list of examples goes on, and the takeaway is clear: passing state laws is an essential catalyst for winning sweeping federal reform on fundamental issues. A Rasmussen poll in September found 71 percent of likely voters still agree with President Donald Trump that the country needs to “drain the swamp” of the political establishment. Voters on the left and the right say corruption in Washington is the “most important” topic for 2018 candidates to discuss, according to a Kaiser Health poll. The issue was also popular for Sen. Bernie Sanders (I-VT), who regularly slammed the “corrupt campaign finance system” in his presidential bid. Proponents: North Dakotans for Public Integrity led the petition drive to gather more than 38,000 signatures to qualify the North Dakota Anti-Corruption Amendment for the ballot. The Amendment increases transparency, roots out conflicts of interest, restricts lobbyist gifts, bans foreign money from elections, prevents personal use of campaign money, closes the revolving door from public official to lobbyist, and holds public officials accountable. Key contact: Mandy Kubik, North Dakotans for Public Integrity, kubik.amanda@gmail.com. Opponents: Big oil corporations and lobbying groups. Here is the link to see who is funding North Dakotans for Sound Government. To view the donors: Select 2018, Select Expenditures, Select Expenditures Received By, Type North Dakotans for Sound Government in the Expenditures Received By Box and Click Search. Proponents: Represent South Dakota led the petition drive to gather more than 50,000 signatures to qualify the South Dakota Anti-Corruption Amendment for the ballot. The Amendment restricts lobbyist gifts to politicians, bans campaign money from unions and corporations to candidates and political parties, bans foreign money, stops politicians from using public office for personal gain, toughen ethics law enforcement and protects voter-approved laws from legislative meddling. Key contact: Doug Kronaizl, Represent South Dakota, ddkronaizl@gmail.com. Opponents: Americans for Prosperity, backed by the billionaire Koch Brothers, and a coalition of lobbying groups. Proponents: Clean Missouri led the petition drive to gather more than 340,000 signatures to qualify Amendment 1 for the ballot. Amendment 1 is a comprehensive anti-corruption proposal that requires legislative records be open to the public, requires politicians to wait two years before becoming lobbyists, eliminates almost all lobbyist gifts, lowers campaign contribution limits and ensures that neither political party is given an unfair advantage when new maps are drawn. Key contact: Benjamin Singer, Clean Missouri, benjamin@cleanmissouri.org. Opponents: Billionaire Rex Sinquefield and a coalition of lobbying groups. Proponents: In Michigan, an anti-gerrymandering measure is on the ballot after Voters Not Politicians gathered more than 425,000 petition signatures with only volunteers within just 110 days. The measure creates an independent redistricting commission for congressional and state legislative districts to fix Michigan’s broken redistricting process. Public Polling: The Sept. 30-Oct. 2 Detroit News-WDIV survey of 600 likely voters showed support for Proposal 2, which would create an independent redistricting commission to draw political boundaries every decade was 55 percent to 23 percent, with 22 percent undecided. The poll had a margin of error of plus or minus 4 percentage points. Key contact: Elizabeth Battiste, Voters Not Politicians, 248-404-7846. Opponents: The Michigan Chamber of Commerce is the top contributor to a ballot committee opposed to the anti-gerrymandering measure. Proponents: Initially, there was a possibility of multiple competing anti-gerrymandering ballot measures, one from a group with significant Republican backers and one from a group with significant Democrat backers. 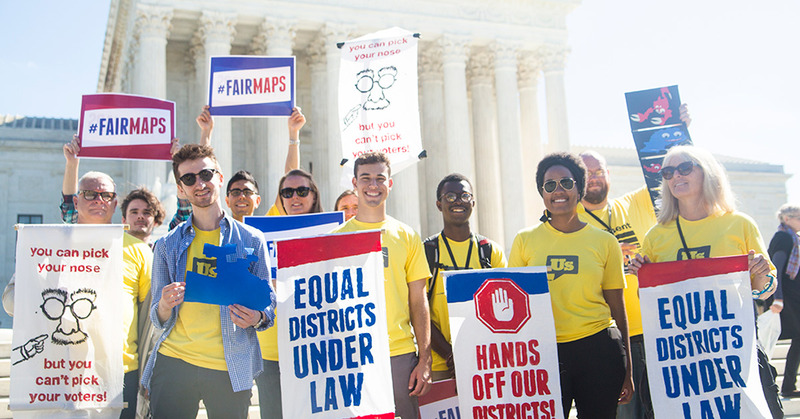 Thankfully, these groups came together to form Fair Maps Colorado. They were able to convince the legislature to refer two anti-gerrymandering measures to the ballot – Amendment Y (Congressional) and Amendment Z (Legislative). These measures prohibit gerrymandering and create fair and competitive congressional and legislative districts. Key contact: Fair Maps Colorado, info@fairmapscolorado.com. Proponents: Better Boundaries led the petition drive to gather more than 150,000 signatures to qualify an anti-gerrymandering Proposition 4 for the ballot. Proposition 4 will fix the broken system by creating an independent citizens’ redistricting commission and new rules to govern the process. Key contact: Better Boundaries, press@betterboundaries.org. RepresentUs is the nation’s largest grassroots anti-corruption group, bringing together conservatives, progressives and everyone in between to pass anti-corruption laws in cities and states around the country.